25% down . For the Luxury package you can split the downpayment in 1/2 . Stunning view venue on 20 acres of peace and privacy. AMAZING 2500 sq ft Victorian home is yours for your wedding day and Honeymoon night . The 5000 sq ft barn is filled with chandeliers and a fabulous lighting system. Vast parklike grounds will amaze your guests. Atmosphere/Decor: Beautiful rustic barn with stunning chandeliers and Victorian decor. With 1000's of lights in all the trees and the amazing views across the valley, Rose Garden Estate is like no other venue in in California . Special Features: 2500 sq ft Victorian home is yours for your wedding day and honeymoon . Relax in your 2 person jacuzzi after the reception. Hand made breakfast is yours to order the next morning. Its filled with fabulous antiques from the 1800's. Rose Garden was so helpful in every way and I was in constant contact with them from emails to texts . I felt confident that everything was going to be taken care of so I wouldn't have to worry about anything but showing up and enjoying my special day . I didn't get a chance to see the wedding setup until I was actually walking down the aisle and I was blown away . Literally everything from start to finish was as perfect as it could be. I never doubted that the wedding would be nice and that everything will turn out as expected but I was blown away by how special and perfect and beautiful it really was . THANK YOU for making the wedding of my dreams ! I can’t thank Rose Garden Estate enough for our perfect day. Communication was always clear and prompt, organizing the day with Paul was so simple and there were no hidden costs. The staff could not have been any more welcoming and professional, it was their priority to ensure we had an amazing wedding - it never felt at any time tacky or rushed, it was just beautiful. Id do it again in a minute...could be back one day for a vow renewal! Thank you to everyone who was involved in our day! I had a Celtic wedding that we loved! Its so different from traditional weddings and the wording is beautiful. I definitely recommend it to anyone who wants a non-traditional wedding that still is very elegant. Excellent food and the scenery is to die for. I got fast and friendly service from the owners the minute I contacted them 9 pm !!! and we were in constant contact till the wedding . The venue is way more pretty in person than the photos show . It's like having an elegant rustic ballroom with a spectacular outdoor setting . The whole setting feels very intimate because it's only for your guests and I felt like every one that worked there actually cared for me and my event which took a load of stress off . I'm very grateful to Paul and Lori and their kids , they were always around during the event to do whatever I asked . Great service and excellent food ! And the big Jacuzzi after the wedding is a HUGE bonus . The view is to die for and the customer service was perfect. I’m so glad I picked the Estate . I’m really, really happy . PS the tri tip is fabulous! The venue itself is gorgeous and the staff is excellent! They worked with us on our budget, and found us a package that fit! The food for the reception was delicious! What else can I say, it was easy and pleasant! Rose Garden Estate staff worked overtime to make my day everything I wanted . The beautiful home was so clean and decorated like a dream . After the wedding I got to sink into the jacuzzi and go over my days events . The barn is very beautiful and the views are magical . Great food and friendly people . I made the right choice . I live near Laughlin Nev and most of my relatives live in LA . After searching lots of places in between I found Rose Garden Estate . We had our wedding and were blown away by the overall experience. The venue itself was exactly what we were looking for in terms of food, atmosphere, scenery and overall experience. We had sole use of the house and barn for our party and were the only people allowed in the venue which was a huge plus. Lorie and Paul were always available for us thru the whole process and we couldnt praise them enough. Lorie is a wonderful minister and made us all misty and smiling with her ceremony and Paul is always a quick text away . As a wedding venue we couldnt fault anything. The food was out of this world , and all our guests commented on the quality . Pauls breakfast has to be seen to be believed! Yummy ... The venue played a huge part in the success of our weekend and the amount of our guests who are still talking about your venue is a testament to that. Myself and my husband can't wait to go back down to stay in the BnB next year for our anniversary. The location is unique and unforgettable . I found the that the owners were constantly available day or night which put my mind at ease . The food is truly wonderful ! It was easy to get a tasting set up with Paul and I came home from the tasting with boxes of food. I got to spend the night before my wedding in the Victorian home ( which is spotless, beautiful and the jacuzzi tub is heavenly) Many brides can’t do that because they are so booked but if you can, do it. Having the ability to set up everything in advance and see it at night was heavenly. My heart sang with happiness that it was all done and I could relax and enjoy my day . It was a beautiful fall day , a little nippy and all the leaves were starting to drop off the trees. It felt like I was back east . Lori's ceremony was simple and her voice is very relaxing, everyone loved it. Paul takes care of things during the day and Lori takes over at night .During the reception I was asked was I happy with the lighting , the temperature ,when would I like to do the toast and so on. I felt like I was in charge but I had no stress because the service was so excellent. I can not recommend this venue enough to my friends . It was a perfect experience. I live in Northridge in the San Fernando Valley . I had been searching FOREVERRR for a place that was spectacular, but it had to be in my budget ( I guess that's why it took me so long to find a place ha ha ) . Some one referred me to Rose Garden and I took the drive . WOW .. It was so peaceful and beautiful . The barn was done in cream , white and gold with brown concrete floors with gold dust on them . The chandeliers were so gorgeous, I fell in love . The cherry on Top was the magnificent Victorian home with views across a huge valley . I was in awe . I thought it was a historic home it was so beautifully decorated inside and out . The owners were absolutely on top of things thru the whole process and the food was really spectacular . It was a wonderful stress free experience from start to finish ! I'm from California city and there's NOTHING around there to get married in. I found Rose Garden on google and saw the reviews on the wedding wire and The Knot . I was surprised when I called at 7:30 at night to leave a message and someone actually picked up ! Paul was really sweet and I set up an appt . My fiancée Rick was saying it's too late expensive for us, let's just get a hall . He really stressed me out until we got there 10 minutes early before our appt . We just sat there and stared at the view and how beautiful and open the courtyard was. Paul got out to meet us and Rick said " you know I was thinking your overpriced , but as soon as I drove up I was sold ". I was so happy !!! We signed that day . I liked that their website has all the prices listed and the contract was simple. I was afraid of hidden fees but we read it 3 times and it was just like the website . Our wedding day this winter was PERFECT . Lorie did our ceremony. ( shes really funny ) After the wedding we cuddled on the soft patio chairs looking at the view. Everyone was gone and we had the whole 20 acres to our selves . It was really magical . The owners were really nice to us and we got handmade French toast the next morning from Paul . YUM . I'm from Pasadena and love it here but it's so expensive, and so was every other venue within 40 miles . A friend in Santa Clarita sent me a link to Rose Garden and I checked it out . Rose Garden looked way too good for the price . I kept thinking where's the catch ? So I go there and it's beautiful and different from any place I looked at before . Huge courtyard with incredible views and the barn was a huge open space . The owners turned on all the lights in the building to show me the effect ( which was really nice ) and I thought WOW . That's even before I saw the Victorian house you get , another WOW . OK Vince and I book on the spot . The owners were always available for any questions and their whole family puts the event together for you which is sorta cool. My colors of Ivory and Gold with pearl center pieces holding white roses was fabulous !! The food was excellent and people were having a great time . As the sun sets thru all the windows and you see the valley below and than they turned on the tree lights , it's amazing . It felt like real luxury . I ended the night in the jacuzzi with Vince and I , snacked on all the left over food the owners had packed up for us in the kitchen . Well , there was no catch , it was as good as promised . FIVE stars !! What to say ? Beautiful , clean, magnificent views and excellent customer service . I'm from Yucaipa and it was a drive for my guests but when everyone got there and saw Rose Garden , they understood why it was worth the drive . The BnB house you get to stay in is a dream made for my vintage wedding . It's much more beautiful in person , the photos don't do it justice . The wedding was perfect !! A big thing that made an impression on me was the owners seemed to be a avaiable anytime of the day or night by text or phone . They set up the whole wedding and kept clearing the tables thru the wedding , so the next day for clean up was easy . My guests were really happy at the place and the food was excellent . The lights were great for dancing and the space itself is wonderful . You can see the view thru the window as you dance , it was just perfect . I live in Palm Springs and I'm so done with the desert . I found Rose Garden on The Wedding Wire cause Tehachapis near my family . I called at 8:30 at night and Paul answered . We talked for like an hour he was very nice . I made the drive with my friends, who were like why are we driving so far ? When we got there and took the tour my friends were like " oh yea this is the place "!! I booked the house the day before so my 6 bridesmaids could spend the night with me . The owners put up tables on the grass area near the angel because we had a caterer come for a rehearsal dinner . We had the whole place to ourselves , it was really quiet and peaceful and the sunset view across the valley blew my friends away . The next morning Paul came and made his cheesy eggs and French toast for everyone with juice and coffee . I was stuffed ! I loved that I told Lorri where everything went and it was all set up in 2 hours . I brought my own table clothes and little gift boxes and they set it up perfect. Lorri married us and everyone laughed at the cute stories she told about us. The flowers smelled beautiful in the courtyard and everyone sat on the benches looking at the view while we were taking pictures . The food and champagne was as good as I was promised ! The DJ ramped it up and we lowered the chandeliers to dance all night . The light in the trees and the gold lights in the venue were really cool. Paul and Lorri kept asking over and over can I get you anything ? I never had such good service before . It was a dream wedding with out stress. Randy and I recommend this place 100% . My fiancée wasn't into wedding stuff and asked me to pick a place . My mom and I had been to other venues and they just rush around and force you to sign a contract on the spot , my mom was not happy . Someone told us about Rose Garden so we drove from Bakersfield and we went for a tour. We spent over two hours asking questions and Paul and Laurie stayed patient the whole time . I said I think I should sign a contract right now I love you guys and Paul said why don't you sleep on it overnight I was shocked ! My mom was telling Laurie how hard it is to be a single mom and Laurie told her of all the years she was a single mom and they both started crying, my mom said this is the place I can feel it . The wedding was wonderful and the food was great , people were having second and third helpings The owners did everything I could possibly ask for to make it my perfect day , this place was a deal and I will be telling all my friends about it I will always be grateful . I'm from Victorville ( there's really no good places there ) . I'd say the biggest comment I got from guests was the place was spectacular and how did I find it ? and the catered food that Rose Garden provided was like eating in a fine restaurant . You know how you go to weddings and the foods really horrible but you eat it because you're starving and there's nowhere else to go ,this was not that place ,it was the complete opposite . People went back for second and third helpings . Another big thing that people liked was they don't use cheap lousy tasting champagne they use a fancy almond champagne , I liked it so much and I normally hate champagne . Every time I walked into the beautiful bathrooms I would walk in on groups of my guests taking selfies against the Victorian mirror or the gold walls . The whole house is done in a Victorian style and my photographer went wild at all the photo opportunities , we went way over time taking photos and finally my bridal coordinator told us people were starving so we rushed back in. Management worked constantly and we're always working with my coordinator so things ended perfectly ! I am beyond grateful Rose Garden was perfect and made my day perfect . Can't say more than that . When I booked this venue a year ago it was just a shell and I was promised bathrooms and that's all I really expected . I'm from the San Fernando Valley so that was the only time I had seen it . When I went back and saw the venue the week before my wedding I was shocked by how beautiful everything was , it far exceeded my dreams of what it would look like . I am mediately made some changes to my wedding Decor, I want from Haybale's to the more luxury things that Rosegarden offered like the chair covers , table Clothes and using all the brand-new decorator things they got in the last year. The lights inside the building on my wedding night were magical . The night was cool and everyone just stood under the softly lit trees covered in lights and looked at how beautiful the view was. When I invited people back into the bed-and-breakfast after the wedding everyone oohed and ahhhhed over the many beautiful things in this Victorian home. Paul and Lori were so kind to my family and did everything perfectly that night , it went so smooth . I feel like I got a really good deal and this place the way it looks now is completely under priced compared to what I saw out there. My family and I are grateful to Rosegarden for giving me more than I expected thank you ! Went for a tour and was able to wander the grounds. Our daughter wanted a Rustic wedding venue and couldn't find anything in our area of Los Angeles that fit her choices, desires and financial means. Unfortunately have a limited income and trying to find a venue that fit that dollar was extremely difficult. We told her we couldn't afford The LA area or a barn theme and she silently was in tears. 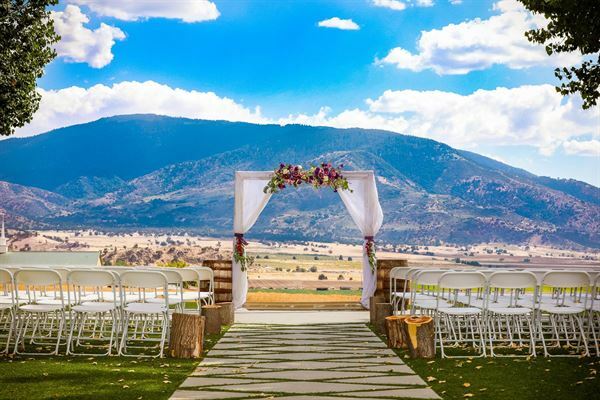 While we were visiting friends in Tehachapi they told us about this new venue Rose Garden Estate. This place is so manicured and well taken care of. Lorie , was there that day and was very pleasant, respectful and "smiley" . She was so nice that we definitely had to try and make Rose Garden work for our daughter. Paul set us up and we worked out a plan....we surprised our daughter with her dream wedding venue and tears of joy are still flowing! Thank you everyone who assisted in getting us together to make the wedding a night to remember. Rose Garden Estate definitely gets 5 stars from us . We weren't disappointed and neither will you. The any day but Saturday package is the best price around . This place was the right place for us . As we drove up Lorie the owner was finishing up cleaning every window in the venue inside and out ! She greeted us with a smile and told us everything from the pretty bed and breakfast to the venue bathrooms was clean and ready for us. It was spotless . She kept asking us thru the day do you need anything ? Can I help you ? It made things easy on me knowing I could ask her help .she was also our minister and asked us lots if personal questions separately than made this beautiful ceremony that was tailored just for us. We both cried , it was beautiful . Paul is friendly and made a wonderful breakfast the next morning of a thing called German baby's pancakes with fresh blueberries , so good. I've been to a lot of weddings recently and the vibe here was warm and nice , not all about business like other places . My friends were shocked at the price it was so good. Go here if your thinking of getting married . Happy happy happy ... We had a wonderful Sunday wedding . It was 116 degrees in Bakersfield but we were all dancing in 75 degree weather . My guests really enjoyed how beautiful the place is and how much cooler it was ., Paul was always in the background asking me if I needed anything - gotta love that . At the end of the night I was glad it had gone perfectly . I soaked in the jacuzzi tub and almost fell asleep . Special Features: All 4 seasons make this location feel like your in a mountain paradise.